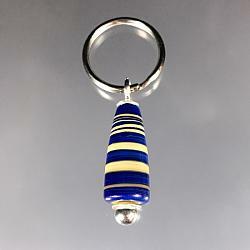 This is a pretty good size lentil bead from My Galaxy Bead Line. It is double stung in SoftFlex wire for extra strength and durability. It measures 29mm x 32mm x 14mm thick. The total length is 88mm. 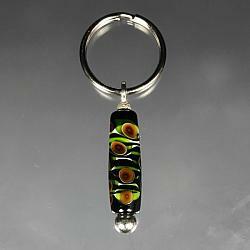 This Keychain features a good size lentil shaped bead from my Galaxy Bead line. It measures 25mm x 31mm x 15mm thick. The total length is 85mm as measured from the ring through to the other end. 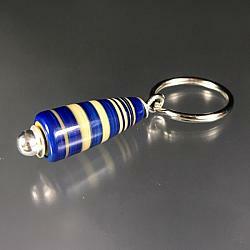 This Keychain is made with a conical Lampwork bead striped in Ivory and Silvered Blue glass. It measures 36mm x 16mm and is 9mm at the small end. Total length is 81mm as measured from the. Ring through to the other end. 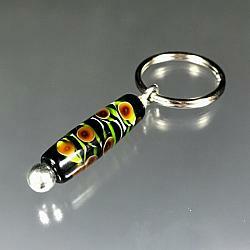 This keychain features a sturdy cylinder which make for a great and little decorative handle. Hang it out side you pocket for a little flair - or not.